Have you been searching online sources or stores for the best mixer available? A mixer that can do everything you need and even more? A mixer, that would last as almost as long as you would? Or maybe just enough till you are unable to bake anymore? Well I would boldly say that this mixer is definitely within your reach, and I assure you that every other veteran baker or Patisserie would swear to this mixer. This mixer is none other than the KitchenAid Artisan. An Iconic mixer which has lasted the test of time and constant baking, it is no surprise to find these mixers in the kitchens of professionals. The KitchenAid Artisan is a stand mixer, and as you all know a stand mixer is capable of having a large and powerful motor, and this is no exception to this best stand mixer as it houses a 325 watt motor that is capable of mixing through the hardest and most dense batter material out there, I even used it to fold my cookie dough. This large stand mixer also comes with a large 5 quart bowl is more than enough space for making cake batter. This mixer also has a 2 piece pouring shield which is situated at the top of the bowl; you can insert and remove the mixer head from the bowl without having to remove this pouring shield. This incredibly well made measure keeps my kitchen and the mixer clean; there is hardly any cleanup to do on the body of the mixer, except for a little dusting and wiping. Now let’s put the obvious aside and look into more detail, the details which make the Artisan the best mixer there is, for example the unique mixing action which it has. This mixer does not only spin the attachments on it, but the base itself has a rotating plate which spins the bowl. The beater will spin clockwise as the plate where the bowl is situated upon will rotate the opposite direction; this will allow the beater to reach all over the bowl not missing a single spot. I personally like this, as I can just leave the mixer on, all I have to do is watch for the batter to be complete and stop the mixer, it’s as easy as that. The multiple speed functions on the mixer add to the control I can have over it, the first level is stir, this one I usually use for really soft things like syrup, while the last level which is level 10 I will use for mixing in cashews and nuts, and believe me when I say that this mixer has no problem dealing with that. The accessories which come with the mixer are very versatile, as a basic you will get a flat beater which I use for tough dough’s like pie crusts and cookies, the dough hook which is really great for kneading bread, and the regular wire whip which you can use for soft batters and liquids. There are also optional attachments made by kitchen aid for this mixer, from the regular like a chopper attachment to something which I was entirely new to, the sausage stuffer, this goes to show that the artisan was made to be a solo machinist in the kitchen. 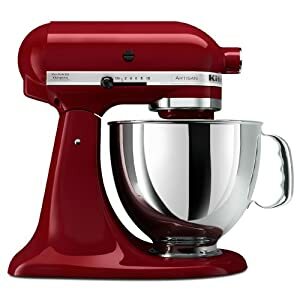 Now let me summarize the quality of this mixer for you, just in case you were too lazy to read through the entire review, basically the KitchenAid Artisan Mixer is really powerful, really useful and the expensive price tag is really worth your money, just remember to buy it from a trustworthy supplier to avoid getting a lemon. Another thing which I would like to add is the number of colors this mixer has, it has almost as many colors as you can think of, so choosing would definitely be a hard process since you are going to be stuck with this mixer for a long, long time.